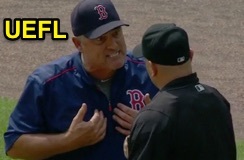 HP Umpire Scott Barry ejected Red Sox 3B Coach Brian Butterfield for arguing a ball two call in the bottom of the 2nd inning of the Red Sox-Tigers game. With one out and one on, Tigers batter Jarrod Saltalamacchia took a 1-0 breaking ball from Red Sox pitcher Clay Buchholz for a called second ball. Replays indicate the pitch was located off the outer edge of home plate and thigh high (px -1.213, pz 1.737) while the 0-0 pitch was located over the outer half of home plate and above the midpoint (px -.468, pz 3.536 [sz_top 3.48]), the call was correct. * At the time of the ejection, the game was tied, 0-0. The Tigers ultimately won the contest, 4-3. This is Scott Barry (87)'s third ejection of the 2016 MLB regular season. Scott Barry now has 15 points in the UEFL Standings (11 Previous + 2 MLB + 2 Correct Call = 15). Crew Chief Jerry Layne now has 9 points in Crew Division (8 Previous + 1 Correct Call = 9). *The overturned Replay Review call during the immediately preceding play (Jerry Layne - Catch/Trap) is considered secondary (or contributory) to the primary argument over balls/strikes. This is the 139th ejection report of the 2016 regular season. This is Boston's 6th ejection of 2016, 2nd in the AL East (TOR 14; BOS 6; BAL 3; TB 2; NYY 1). This is Brian Butterfield's 1st ejection since July 6, 2014 (Hunter Wendelstedt; QOC = Y [Balk]). This is Scott Barry's first ejection since May 4, 2016 (Paul Molitor; QOC = Y [Balls/Strikes]). Wrap: Boston Red Sox vs. Detroit Tigers, 8/18/16 | Video available via "Read more"